SKU: N/A. Category: Eukanuba. Tags: Eukanuba, Hearty Stew, with Beef & Vegetables in Gravy. Eukanuba Hearty Stew With Beef And Vegetables In Gravy. 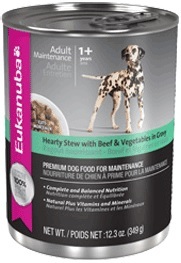 Product Description: Eukanuba Hearty Stew With Beef And Vegetables In Gravy Premium Canned Nutrition. Eukanuba Hearty Stew With Beef And Vegetables In Gravy Composition. Meat Broth. Chicken. Chicken Liver. Chicken By-Products. Beef. Wheat gluten. Potatoes. Carrots. Peas. Beef Liver. Meat By-Products. Dried Beet Pulp. Salt. Potassium Chloride. Calcium Sulfate. Sodium Tripolyphosphate. Flax Meal. Guar Gum. Natural Flavor. Caramel. Fructooligosaccharides. Vitamins (Ascorbic Acid, Thiamine Mononitrate (source of Vitamin B1). Calcium Pantothenate. Biotin. Vitamin B12 Supplement. Niacin. Riboflavin Supplement (source of Vitamin B2). Inositol. Pyridoxine Hydrochloride (source of Vitamin B6). Vitamin D3 Supplement. Folic Acid). Carrageenan. Choline Chloride. Minerals (Ferrous Sulfate, Zinc Oxide, Manganese Sulfate, Copper Sulfate, Manganous Oxide, Potassium Iodide, Cobalt Carbonate). Vitamin E Supplement. Beta-Carotene. Crude Protein (Min) 8.5 %. Crude Fat (Min) 5.5 %. Crude Fiber (Max) 1.75 %. Vitamin E (Min) 50 IU/kg. Omega-6 Fatty Acids (Min) 0.9 %*. Omega-3 Fatty Acids (Min) 0.1 %*. Weight (lbs) Feed Daily (cups). “Thank you for the great advice I received. You suggested I move my 8 year old mix breed dog onto Eukanuba Mature & Senior Small Breed to help with her dental problems and bad breath. I have fed my dog Mieke on Eukanuba for 1 month now and I have to say BRAVO!!! Honestly a complete improvement, from now on Mieke will only get Eukanuba. Thank you very much! !” Mrs S Vanhentenrijk. 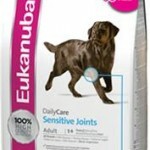 Purchase Eukanuba Hearty Stew With Beef And Vegetables In Gravy From Pet Store To Your Door Today.